Losing any kind of data could be frustrating for anyone and it could be even worse when the data stored in your phone; data in smartphone is something you have no copy of. It is often seen that people never think of the happenings that may cause your important data to vanish. This is why we always recommend to have backup copy of your important data like your contact numbers, addresses, pictures and so on, loosing which might put you is trouble. There are many backup applications available on internet provided by numerous companies at no cost. Depending upon the particular usage and required features, one can easily download the free smartphone data backup apps directly from the Google Play Store. 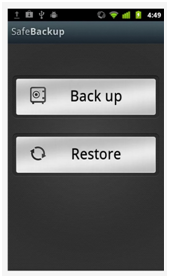 1) Titanium Backup – This app is mainly available for rooted phone users. Cost – Free and paid both versions are available. Paid PRO version is available with added interesting features. 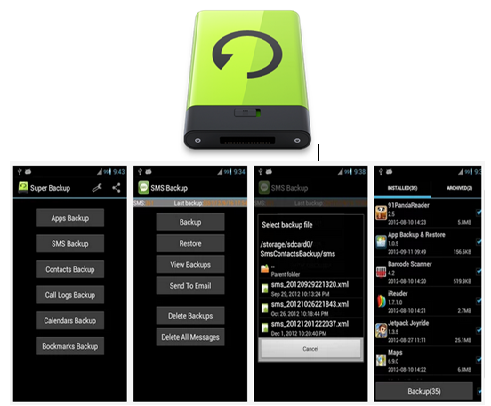 2) Super Backup: This app is mainly for backup SMS, call logs & Contacts to SD Card or to Gmail account. Auto upload scheduled backup files to connected Gmail account. Backup folder path could be changed. Backup and restore apps to SD card. Cost – Free and paid both versions are available. 3) Mobile Backup & Restore by Avast – Alike expert Antivirus Avast backup is also amazing. Backup photos, contacts, SMS, Call Logs, Music, videos, apps. Available in paid version with added features. Compatible with all major android versions and allow easy exchange of data between different versions. Can be used to backup pictures, music, video, bookmarks, ringtones, voice memos, contacts, messages, call logs and alarms. Paid version available with added features. 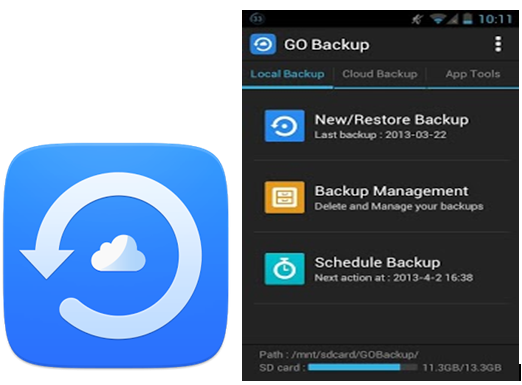 5) GO Backup & Restore – Go Backup and restore, a professional tool to help backup and restore user data, system settings, apk files and app data. 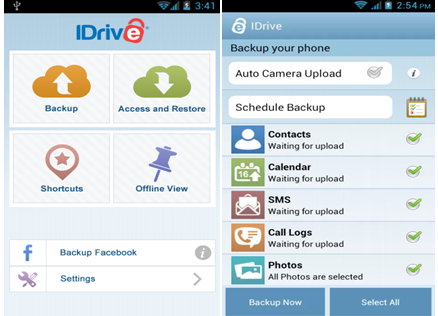 6 ) IDrive (Online Backup) – This app allows users to take data backup with a “single tap”. This app is not only compatible with android phones but also with PCs, Macs, iPhones and iPads. A great app to backup contacts, photos, videos, SD card files, call logs, calendar and text messages. Basic version has 5 GB storage space which is huge. Note – We would advice our readers not to keep any confidential information in your smartphone. Summary: Such mobile applications would help you to store your important data as a backup. These applications are easy to install and user friendly. 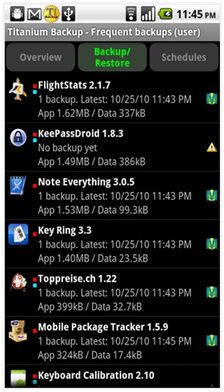 If you do not have any backup application installed on your phone then install any of them now to keep your data safe now! Nice post and yes Backup is necessary for smartphones because nowadays we’ve kept almost everything in our smartphones for our easy accessibility, So a data backup application is much needed. Thanks for sharing some recommended application about the same.